FOR years, bikers have looked down on scooters as under powered toys; ridden by students or trendies in thongs and t-shirts, filling a niche, but in no way were they ever real motorcycles. Worse still, scooters have been seen as buzz box noise makers; they don’t go, they don’t stop, and they have little wheels. So called real riders studiously ignored them where possible. No polite nods and definitely no recognition. 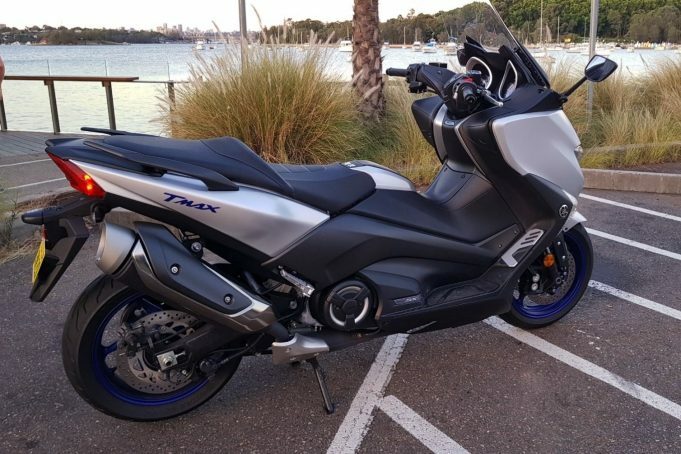 Over the last few weeks though, Yamaha has allowed us to explore the sub culture that is scootering, with a 2018 Yamaha TMAX 530 SX. We have to tell you something though, scootering is not what it seems, and it’s more enticing than you think. The TMAX, which has been around since 2001 and is now in its fourth generation, adds the benefit of an automatic transmission to a mid-sized bike, meaning not only can it putter its way through traffic, the open roads are now a realistic option. Riding one will change your perspective, and throw out everything you thought you knew about scooters. It has many of the features one would expect on modern street bikes and tourers; ABS, traction control, and LED day lights. But it has some luxury features too; key-less start and locking, a lockable glove compartment with USB port, and did we mention it has a boot, and a boot light, and a handbrake. The large and supportive seating is also a major plus. Having jumped off a bigger road bike to spend time on the TMAX, the the upright dining chair seating position did take a bit of getting used to, and initially it just feels wrong. The wide seat over the engine and CVT unit also means the bike is quite wide. It meant that putting your feet down was a little like riding a horse; you found yourself with bowed legs, just reaching the ground with toes. The alternative was to slide forward on the seat and stand up. From a power perspective, the liquid cooled four-stroke horizontal straight-twin (both cylinders pointing forward) engine, with 4 valves per cylinder, was definitely capable, and unlike other scooters, is set forward of the swing arm, more like a real bike. It drives a V-Belt through a CVT gearbox that keeps the bike’s weight low and centred, giving additional balance and stability. The engine produces 33.8kW of power and 53Nm of torque, managed via an electronically controlled throttle and traction control system. The CVT optimises the delivery of the power by maintaining the engine revs in the range best suited to the rider’s desire (how far you have twisted the grip! ), and it goes. The scooter accelerates crisply, and due to the balance, manoeuvres very nicely. While not quite as narrow as say a Vespa, it can fit between traffic with alacrity and the stability at very low speeds give the rider confidence to do it. The new TMAX comes with 15-inch wheels, up from 14-inch and gets uplifted inverted front forks. This change provides for a fair amount of travel front and back, so it does actually handle most of the road conditions around Sydney, but probably not quite as well as a similar sized road bike. It also has selectable Sport and Touring modes, with a surprisingly noticeable difference between them, with Touring dropping the revs at cruising speeds, and while not sluggish, it does reduce the oomph away from the lights. It stops too. 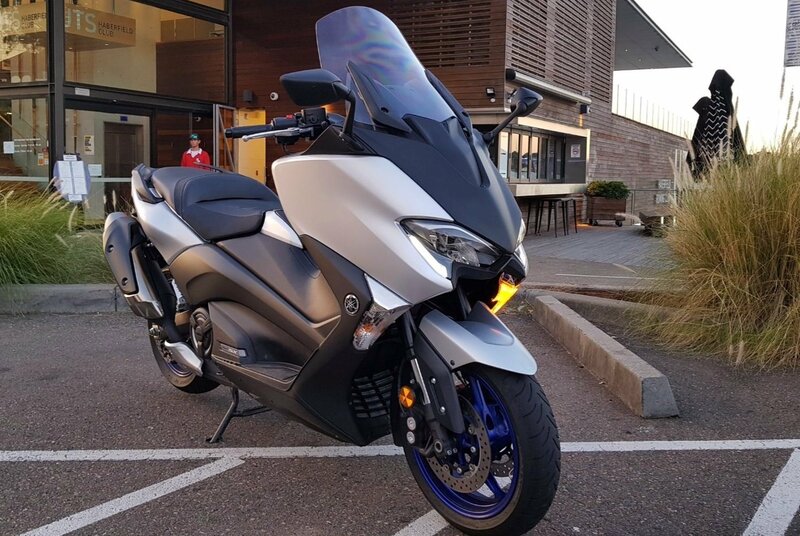 The scooter is fitted with hydraulic 267mm twin fronts disc brakes and a 282mm rear disc – which, given the 220kg weight of the bike, brings the 2018 Yamaha TMAX to a stop, very well. Oh, and that handbrake we mentioned – it is a second mechanical calliper on the rear disc, controlled from a lever under the left hand grip. It gives you the chance to relax at lights and when stopped in traffic without having to hold down the regular brake. One other thing though, while we’re talking brakes. The rear brake was “tested” several time when our rider decided a gear change was necessary (out of habit) and hit the “clutch” hard, only to find the bike slowing rather drastically. It’s no lightweight either, but again the low centre of gravity means you don’t really feel the weight on the road. 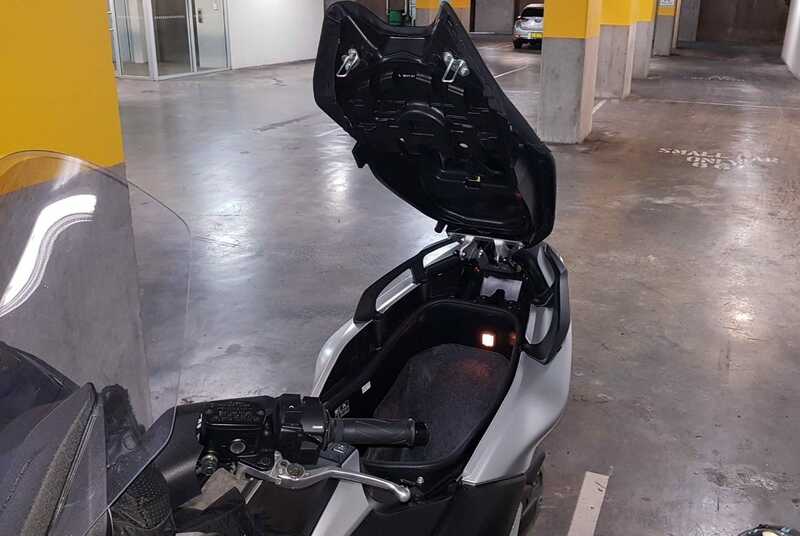 Throughout testing, our 120kg big boned cruiser rider found the scooter responsive and easy to use in traffic, enjoying the auto in stop start congestion. The fairing provided a good level of wind and weather protection, and tucking the knees in reduced the exposure further. We only got lightly sprinkled on in the rain while moving, which was pretty impressive. On this model, the SX, the screen is manually adjustable and involves a toolkit and patience. The DX gets an electrically adjustable screen and cruise control. There are also lots of accessories, including a sports exhaust, and passenger back rest. One small downside are the mirrors, they are set forward on the fairing and are a good distance from the rider. While they provide relatively good vision on either side, our rider could not see traffic in the lane behind him, and despite adjustments we couldn’t solve the issue. It meant we had to lean to the side or lift our arms, in turn releasing our hold on the handlebars, to see. Onto other things. The boot is big enough for a small bag and a helmet, or a couple of bags of groceries. Mind you, we wouldn’t put ice cream in there, as it does get warm sitting over the engine and exhaust. The remote key fob is also a great little feature. It means you can just walk up, sit down, put up the side stand, hit the on button, the brake and the starter. The same process can be reversed when you park it; the engine shuts down when the side stand is deployed, you can just hit the shutdown button and walk away. The steering, petrol cap and seat lock automatically when you are three metres from the bike. Even cooler is the fact that if you leave it on the centre stand, that’s locked too, so the bike can’t actually be rolled away. 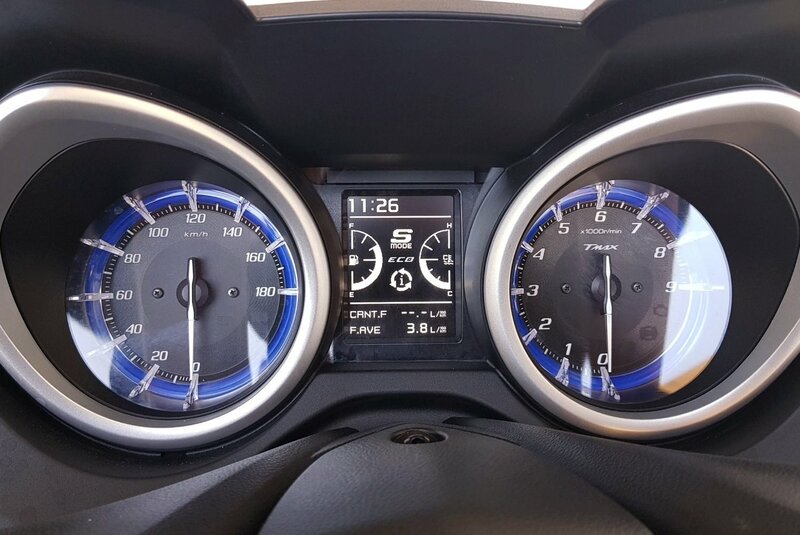 We’re pretty impressed with the dash too, it’s very car like, with an LCD info screen tucked in between the tacho and speedo. You’ll find trip meters, petrol details, temps and a consumption/economy indicator, as well as access to the setup menu. It’s easy to navigate and fairly intuitive too. It’s here you can switch of the ABS, but not the traction control. 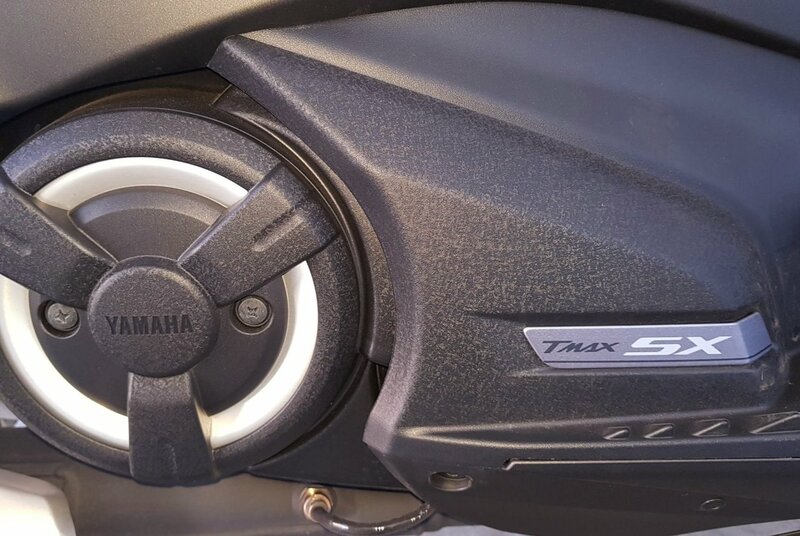 Overall, the 2018 Yamaha TMAX 530 SX is a really fun machine, with excellent fuel economy (4.1-litres/100km) from the 15-litre tank, giving you about 300km of travel distance. It’s easy to ride, and it looks fairly imposing on the road, which is always a bonus, as is the large on-board storage, with the remote key the final kicker. It’s targeted at returning riders and city dwellers who do the occasional country trip, and it suits both perfectly. It’s available in Black or Silver and starts from around $13,990 plus on-roads for the SX variant. It’s competition includes the Aprilia SRV 850 (yes that really is an 850cc scooter), the BMW C 650 GT and KYMCO AK550. 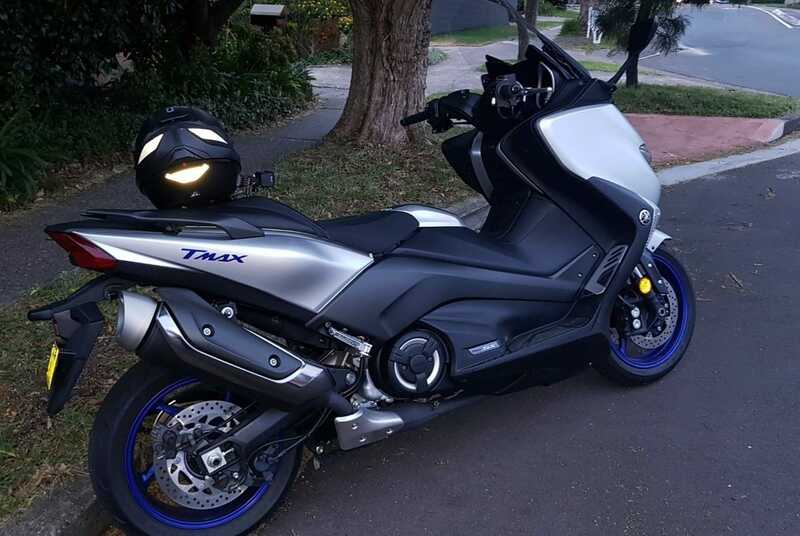 Our 2018 Yamaha TMAX 530 SX was provided by Yamaha Motor Australia. To find out more, contact your local Yamaha Motor dealer. Pros - fit for purpose; comfortable and easy to use; fun to ride. Cons - no cup holder; seating position for long trips is too static; mirrors. It may look like a toy, but the pint-sized soft-topped pocket rocket that is the 2017 Lotus Elise Sprint 220 is a light, nimble and wickedly quick play thing that pushes out 160kW of power and 250Nm of torque from its 1.8-litre supercharged Toyota power plant. TAKE everything you know about the Santa Fe and chuck it out the window. Okay, it's not really that big a change, but the 2019 Hyundai Santa Fe Active is definitely a whole new experience.